Powers/Abilities: Although he possesses no superhuman powers, Brooklyn Barnes is a soldier experienced in combat and skilled in the use of firearms. 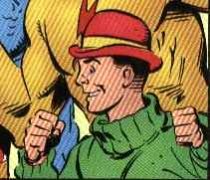 (Super-Soldier: Man of War#1 (bts)) - In the early days of World War II, school boy "Brooklyn" Barnes joined up with the Young Commandos and became the official kid mascot of the All-Star Winners Squadron. (Super-Soldier: Man of War#1) - "Deadly Cargo" - In February 1942, young "Brooklyn" Barnes was present in the All-Star Winners Squadron's Midtown Clubhouse in Metropolis when Super-Soldier (Clark Kent) returned from a top-secret mission briefing in Washington, D.C. Super-Soldier informed his fellow Winners that he had been ordered to follow a consignment of stolen government equipment being smuggled overseas. "Brooklyn" Barnes offered to come along with the Young Commandos (although American Belle thought that this was merely an excuse for Barnes to skip school), but Super-Soldier turned down the young boy's offer because it was an undercover mission. (Spider-Boy#1 (bts)) - Decades later, "Brooklyn" Barnes (now an adult) became a member of the New York Special Crimes Unit, a division of the New York Police Department that specializes in dealing with metahuman criminals. (Spider-Boy#1) - "Big Trouble!" - Along with the rest of the New York Special Crimes Unit, "Brooklyn" Barnes opened fire on the villain King Lizard as he battled Spider-Boy (Pete Ross) on Kesel Street in New York City. Although they temporarily stunned the massive villain, King Lizard retaliated by ripping the pipes out from under the street, causing the entire New York Special Crimes Unit to come crashing to the ground. Afterwards, "Brooklyn" Barnes and the Special Crimes Unit were forced to regroup and leave King Lizard for Spider-Boy to handle on his own. The Young Commandos were a team of child adventurers dedicated to fighting the Nazis during World War II. "Brooklyn" Barnes was one of the team's enthusiastic young members. 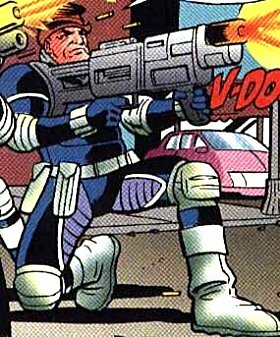 The Young Commandos are an amalgam of the Young Allies of the Marvel Universe and the Boy Commandos of the DC Universe.